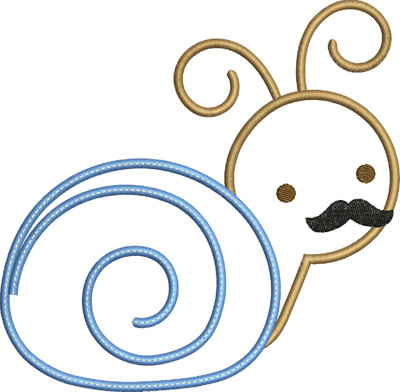 A super cute snail with a mustache! Featuring the super popular mustache. The mustache can be omitted by not stitching the final color. A super cute snail with a mustache! (the mustache can be omitted by not stitching the final color). 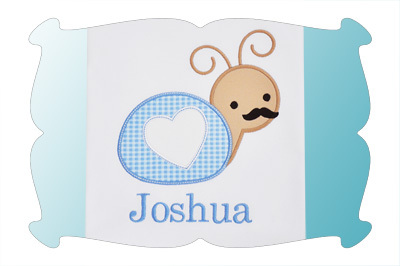 The embroidery font shown (the name Joshua) is available as a separate purchase. Please see Natalie Embroidery Font. The "Boy Snail Applique" design comes in 4 sizes. All sizes included with your purchase! 4x4: 3.88 x 3.79. SC: 6037. 5x7: 4.93 x 4.82. SC: 7891. 6x10: 5.91 x 5.79. SC: 9365. Durkee 9x9 Hoop: 6.86 x 6.71. SC: 11,163.